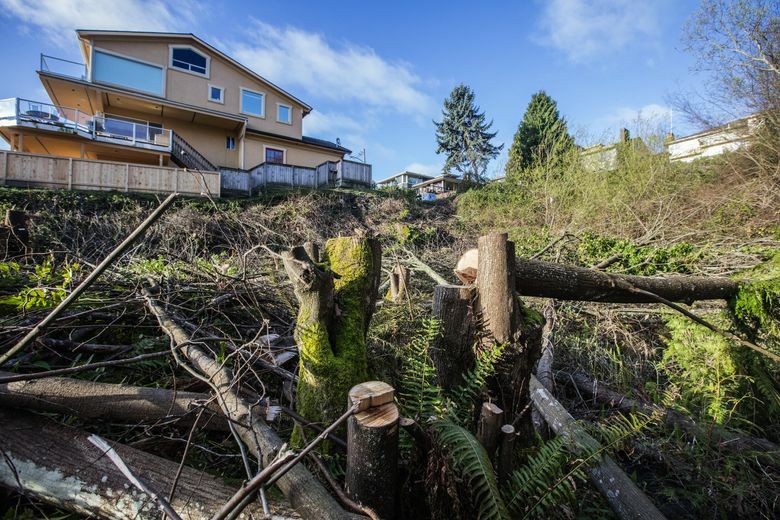 A lawyer representing a homeowner responsible for the unpermitted cutting down of more than 153 trees on public property in West Seattle reported the destruction to the city early last month. 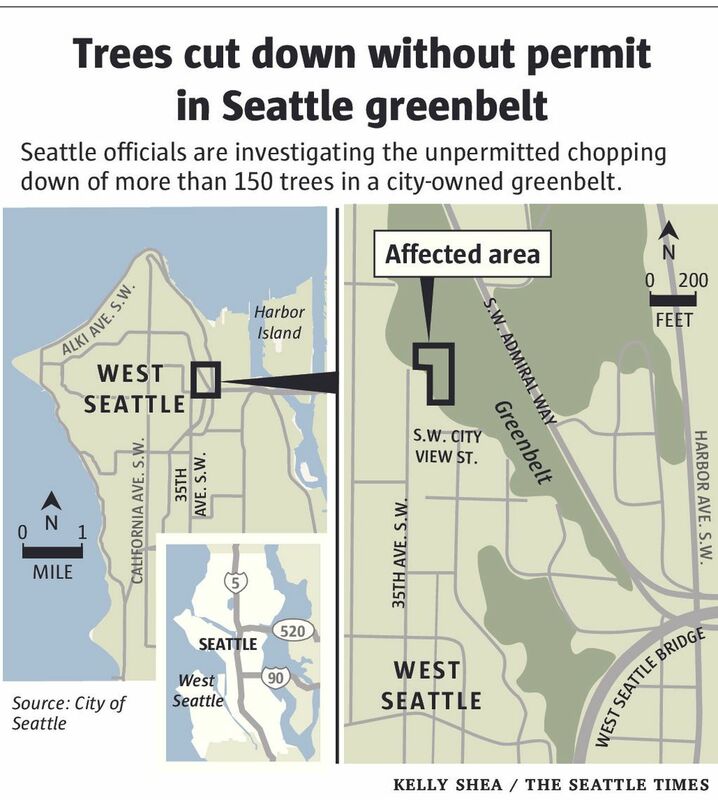 People responsible for illegally cutting down more than 150 trees in a city-owned greenbelt next to West Seattle view homes, including at least one homeowner, may face criminal charges, City Attorney Pete Holmes said Monday. Holmes has asked police to find out who ordered, paid for and carried out the destruction, and he’s also pursuing civil remedies. The cutting could result in felony charges because restoration will cost at least several hundred thousand dollars, he said. 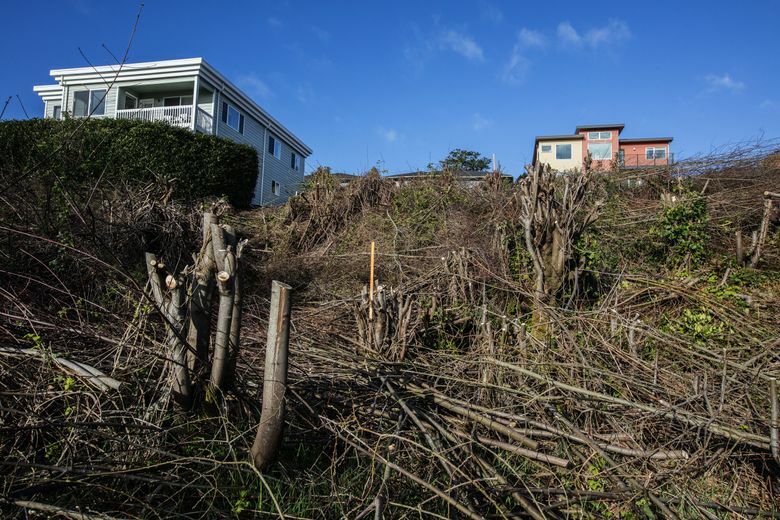 More than an acre of the West Duwamish Greenbelt was wiped out on the hillside north and east of the 3200 block of 35th Avenue Southwest, The Seattle Times reported Friday. The 153 downed trees of varying sizes included many big-leaf maples and Scouler’s willows, and were left lying on the hillside. In a statement late Monday, a lawyer for a homeowner on the block called the cutting a mistake, saying his client and other neighbors hired a landscaping business to top and prune some trees to improve their views. The lawyer, Clayton P. Graham, said his client was on an out-of-town trip when the trees were destroyed and said the company his client hired only cleared part of the damaged area. Graham didn’t identify his client. Officials were alerted to the cutting about two months ago but didn’t make their investigation public until they were questioned by The Times. On Jan. 15, a member of the public emailed a city arborist to report tree branches had been cut at the site, Holmes said. On Feb. 5, with officials not having yet checked out the tip, a lawyer representing a homeowner responsible for the cutting wrote to Seattle Parks and Recreation Superintendent Jesús Aguirre to report the damage. The lawyer said his client wanted to work with officials to make up for the destruction. “We write to disclose tree pruning and cutting work carried out by a third party contractor on behalf of my client and others,” lawyer Clayton P. Graham wrote. “The unfortunate decision was carried out in a manner that does not reflect my client’s respect for the city or the Parks Department and while he alone was not the only participant, he feels it is appropriate to self-report this matter and work to mitigate any negative consequences,” Graham added. Holmes thus far knows of two responsible parties, spokeswoman Kimberly Mills said, declining to reveal their identities Monday. “We’re not going to release their names until we finish the investigation,” she said. Holmes believes there are additional responsible parties but doesn’t yet know who they are, Mills said. She said Holmes didn’t make the investigation public earlier partly because officials didn’t see the damage for weeks and didn’t realize how bad it was. Officials didn’t clearly explain why they didn’t tell The Times last week about their communications with Graham. The lawyer didn’t return a phone call and email Monday. “I am reaching out to you, Mr. Aguirre, because our client wishes to work with Parks to rectify any damage that may have been done to city property in the course of this work,” he wrote in the Feb. 5 letter. City Councilmember Lisa Herbold, who represents West Seattle, said she’s glad the City Attorney’s Office is considering all possible actions, including criminal charges. Herbold said any damage assessment should take into account how trees contribute to the environment by mitigating air pollution and protecting against landslides. Seattle law prohibits the removal of trees from environmentally critical areas, public and private, without prior approval. The clear-cut area in West Seattle is considered environmentally critical due to its steep slope and is part of a known landslide zone. The lawyer said his client had already hired “an experienced urban forester” to recommend and help carry out a restoration plan. Graham suggested that Parks grant his client permits to implement the restoration. The lawyer didn’t identify the other parties he said were responsible. “We have contacted you because our client wishes to find a mutually acceptable plan to address the work that took place on city property,” he wrote in the letter. Mills said Holmes has hired the consulting company Tree Solutions to review the damage and propose remediation. The company’s report isn’t yet complete. Aguirre said Parks is supporting Holmes’ office in its investigation. He said Parks didn’t publicize the cutting in order to protect the legal case against the perpetrators. “This is going to require lots of replanting because this is a slide-prone area,” he remarked, saying mature trees likely will be brought in, rather than seedlings. There was no answer Friday at the home nearest to many of the destroyed trees. A man who answered the phone at the home across the street Monday said he had no role in the cutting. He declined to give his name.